Audi A4 Android head unit is a direct radio replacement for Audi A4, so factory radio and CD system will be replaced with the new DVD player radio unit. The upgrade is based on Android 8.0 system, 8-Core CPU, 32GB ROM and 4GB RAM. No matter if your Audi A4 has factory navigation system or not, this Audi A4 aftermarket navigation has its navigation function built-in, which supports GPS maps including Sygic, igo and Google maps as well. GPS navigation system can be upgraded in the future for free from us. With this Android Audi A4 radio replacement installed in your car, you and your passengers can enjoy music and video playing through many other ways while driving. 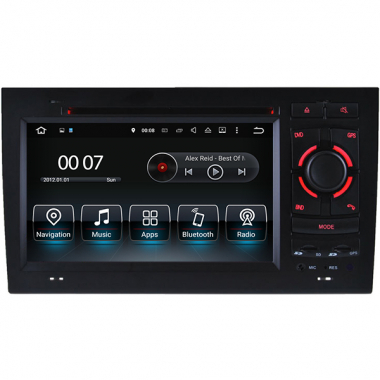 First of all, the built-in car DVD player can work while driving, DVD player supports music and video playing. USB and SD can also support lossless music and HD 1080P videos. You can also install online music or video apps like Spotify, Youtube from Google playstore. Blueooth hands free phone releases your hand for making and answering a phone call while driving, so you can focus on driving and at the same time talking on the phone with hands still hoding the steering wheel.